Some folks would say that all cameras I have had over the years have been toys. They haven't been "high end" cameras. Last Sunday (Nov. 20) All Things Considered news magazine, on NPR, did a segment called "Loving imperfections of toy cameras." Good for them. Much of the segment dealt with the effects of light leaks. I say, light leaks can be redefined as "serendipitous enhancements to the artistic statement of a photo." It can be seen as an alternative to "setting the bar so high" in that world of professionalism where everything becomes subjugated to refinement of technique and equipment. This light leak photo was taken during my 1987 bike tour along Pacific Coast as I passed through Port Townsed, WA. 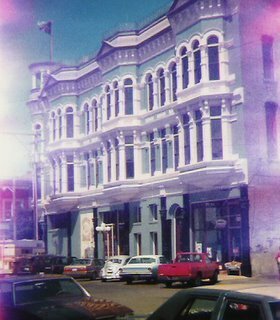 Image of that ornate building was enhanced because my roll of film got exposed to some light as I took it out of the camera. Oh no, I guess that doesn't qualify as a "light leak" since it didn't come from the camera itself, but maybe I should get a medal for having a sharp memory. It was from taking the film out of the camera. My fingers must have fumbled so a few frames toward the outside of the roll got hit. Other images from that camera had no leakage, so it wasn't the camera. I don't have a big collection of light leak photos even though this phenomena may become the next imaging fad. I'm not a specialist in any one style. What I do have is an eclectic selection photos and commentary from years of bicycle touring. To me, the subject is what really matters, not the various fads in technique or expense in camera. See some of my Touring Album.